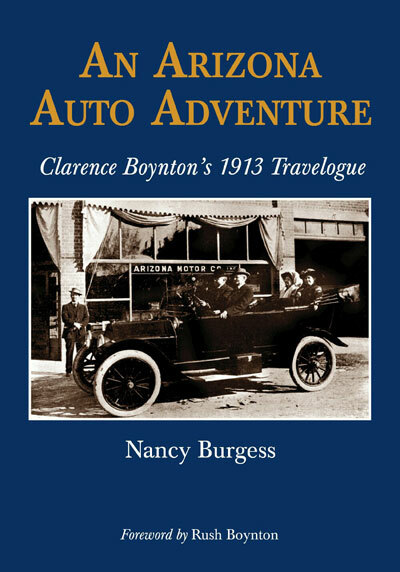 This book includes a travel journal of a 1,000 mile driving trip in Arizona in 1913. The journal is included in its entirety, is unedited, very well written and really gives the reader a sense of what travel was like as the days when the use of horse, mule and oxen drawn conveyances was fading and the popularity of the automobile (which is referred to throughout the journal as the “machine”) was growing daily. Clarence Boynton was a patient at St. Luke’s Home (TB Sanatarium) in Phoenix and he and his wife traveled with Dr. W. Warner Watkins, the medical director of St. Luke’s, and his wife and 9-month-old daughter on this 36 day trip in the fall of 1913. The book includes historical information about travel in Arizona at the time, Mr. Boynton and Dr. Watkins, treatment of TB in the west in the early 20th century and lots of information about the places they traveled to and through, plus 200 photographs, maps and advertisements, mostly circa 1913. The foreword was written by Rush Boynton, Clarence Boynton’s grandson.